Subscribe to get deals from hundreds of merchants including the best of Hotels.com! Hotels.com offers up to 8% off hotel booking with Dah Sing Credit Card. The offer is valid until 31 December 2019. Get the deal. Please always check with the merchant on the validity of the promotion before purchase. Valid With Standard Chartered Priority Banking Credit Card and Visa infinite Credit Card.This promotion is valid Valid until 31 December 2019. For travel until March 31, 2020.. Please always check with the merchant on the validity of the promotion before purchase. Valid with all all Standard Chartered credit cards.This promotion is valid Valid until 31 December 2019. For travel until March 31, 2020.. Please always check with the merchant on the validity of the promotion before purchase. Valid with all DBS credits cards only.This promotion is valid Valid until 31 December 2019.Valid for travel until December 31, 2019.. Please always check with the merchant on the validity of the promotion before purchase. You must make a reservation on the Hotels.com/MasterCard website by 11:59 pm on December 31, 2019, and complete your stay on or before March 31, 2020. Reservations are subject to availability and are subject to the hotel's terms and conditions.. Please always check with the merchant on the validity of the promotion before purchase. Hotels.com offers special deals for Southern Asia hotels. Please visit the merchant's website for the hotel list. Please see specific details for each hotel listed above by clicking the hotel of your interest. Search with your preferred travel dates to view the discounted rates applicable for your stay. The hotel discounts advertised on this promotion page apply to selected hotels only and all rates are subject to availability. The discounted hotel rates can also be accessed via searching on the Home page. Prices are per double-room including all taxes and fees. T&C apply. Please always check with the merchant on the validity of the promotion before purchase. Get instant savings with Secret Prices and enjoy free nights. Please refer to the merchant's website for details.. Please always check with the merchant on the validity of the promotion before purchase. Sign up for our emails to pay less with Secret Prices and get exclusive offers. Please refer to the merchant's website for details.. Please always check with the merchant on the validity of the promotion before purchase. Please see specific details for each hotel listed above by clicking the hotel of your interest. Search with your preferred travel dates to view the discounted rates applicable for your stay. The hotel discounts advertised on this promotion page apply to selected hotels only and all rates are subject to availability. The discounted hotel rates can also be accessed via searching on the Home page. Prices are per double-room including all taxes and fees.. Please always check with the merchant on the validity of the promotion before purchase. Hotels.com offers a 20% off on Hotel bookings using on MasterCard.More savings on your hotel bookings! Pay with your Citi MasterCard. The offer is valid until 28 February 2019 Remember to apply the Hotels.com promo code at checkout.. Please always check with the merchant on the validity of the promotion before purchase. Only available for selected Standard Chartered cards with a minimum spend of HK$1800. Enter the promo code at checkout to get the offer. The promotion is available until 31 December 2018 for stays until 31 March 2019. T&C apply. Please always check with the merchant on the validity of the promotion before purchase. Only available for selected Standard Chartered cards with a minimum spend of HK$2700. Enter the promo code at checkout to get the offer. The promotion is available until 31 December 2018 for stays until 31 March 2019. T&C apply. Please always check with the merchant on the validity of the promotion before purchase. Get 12% off hotel bookings on hotels.com when you use your citibank visa card! Offer valid for booking period: Now till December 31, 2018 and stay period: Now till March 31, 2019. Click www.hotels.com/visa and select a participating hotel.. Please always check with the merchant on the validity of the promotion before purchase. BOC Mastercard Credit Cardholders can get 15% off at Hotels.com. Offer is only applicable for the first 3,000 spender, it will be 8% off hotel bookings after the quota is full. The promo is valid until 28 February 2018.. Please always check with the merchant on the validity of the promotion before purchase. HOTELS.COM HK BRINGS YOU THE BEST PROMOTIONS! Yay to holidays! Looking for the latest Hotels.com promotion code and discount code? Whether it's a solo trip, family trip, business trip or a getaway with friends, you will absolutely need a place to spend the night. This is where Hotels.com comes in and helps you make these difficult decisions. Hotels.com is not only one of the biggest accommodation websites available online, you can also find numerous Hotels.com discount codes and promotion codes to help you stay within your budget. There are a lot of things to consider before picking the perfect place for you, your family members or your travel companion to stay. Aside from not going over your budget, the location of the hotel, the amenities they provide, how clean the rooms are, etc have to be considered as well. Maybe you need two beds in a room? Or maybe a bathtub in the bathroom for that little luxury? Sometimes you just cannot just overlook these needs. You also would not want to skip going to see an attraction because you spent too much on the hotel room. HOW TO SAVE BIG WITH HOTELS.COM HK! Choose from the 3-star to 5-star hotels available on Hotels.com, but with prices lower than it usually is elsewehere. No matter where you plan on going, Hotels.com has the perfect room for your perfect night. It does not matter where you plan on going, whether you are heading to big cities like Singapore, London, New York or Tokyo or small towns, Hotels.com will help you find your ideal accomodation. One of the best features on Hotels.com is the review section. Real people who have stayed in these hotels and loved their stays are encouraged to leave a review so you can gauge if the hotel you have shortlisted is ideal for you. Hotels.com is there to help you with every single step you take towards your perfect holiday! Founded in 1991 with the name Hotel Reservations Network (HRN), Hotels.com proves that it is still one of the biggest accomodation website available. The company started as a hotel-booking agency where people can call in for free to book their rooms in the United States. When acquired by the parent company Expedia Inc. in 2002, HRN changed their name into Hotels.com and started to allow people book their hotels online. Since 2002, they have expanded to many websites for North, South and Central Americas, Europe, Australia, Japan, China, the Middle East and South Africa. Hotels.com local sites for Vietnam and Indonesia were introduced in 2011. In 2018, hotels.com owns 85 websites in 34 languages, making it accessible to almost everyone on the planet. On top of that, Hotels.com lists more than 325,000 hotels in around 19,000 locations all over the world! One of the biggest draw of Hotels.com would be their loyalty programme. Hotels.com will award you one (1) free night after you book ten (10) nights with them! Don't forget to register for a hotels.com account or sign-in with your existing account when you book your stay to enjoy this reward. Being a member of Hotels.com also gives you the benefit of knowing your “secret price” instead of regular pricing. Members who use Hotels.com regularly get more discounted prices compared to other people who use it every now and then. Being a member of Hotels.com, they will send you unbelievable deals to your email. Select your destination, the name of the hotel, the famous landmark located in your destination or the address of the area you want to stay in. You will then need to put the dates of the travel, how many rooms you need and how many people are in you party. Hotels.com will then show you all the available hotels on your selected dates. This results page has everything you need to find the hotel you want. You can set the maximum price that you want to spend, the star rating of the hotel, the guest rating and even filter out the amenities that you need! Scroll down on the hotel you selected and pick the room you want. Be careful though, because the cheapest room available do not usually come with free breakfast or that the price is non-refundable. The rooms that are marked free cancellations usually offer you the choice to pay for it right away or pay only when you arrive at the hotel. Once you are set with your choices, you can pay for the hotel online using your debit or credit card. Don’t forget to put in any Hotels.com promotion code or discount code that you found here at Cardable HK! When your booking has been confirmed, you are all set to enjoy your stay - thanks to Hotels.com! 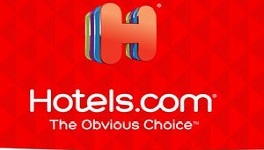 MORE CHOICES AND DEALS AT HOTELS.COM! Hotels.com has been around for years making it one of the most reliable websites to find the perfect accommodation for your travels. They can help you find what you want from a hotel and make sure that you get that perfect night you are looking for. Just with the tip of your fingers, you can have the perfect night you are looking for. With the latest Hotels.com promotion code and discount code here on Cardable, you can maximise your budget to its fullest potential and enjoy your travels!